Often when we cook at home or eat in a restaurant, we have leftovers. Especially this time of the year. To ensure that leftovers are safe to eat, make sure the food is cooked to a safe temperature and refrigerate the leftovers promptly. Not cooking food to a safe temperature and leaving food out at an unsafe temperature are the two main causes of foodborne illness. Safe handling of leftovers is very important to reducing foodborne illness. Follow the USDA Food Safety and Inspection Service’s recommendations for handling leftovers safely. Bacteria grow rapidly between the temperatures of 40° F and 140° F. After foo d is safely cooked, hot food must be kept hot at 140° F or warmer to prevent bacterial growth. Within 2 hours of cooking food or after it is removed from an appliance keeping it warm, leftovers must be refrigerated. Throw away all perishable foods that have been left in room temperature for more than 2 hours (1 hour if the temperature is over 90° F, such as at an outdoor picnic during summer). 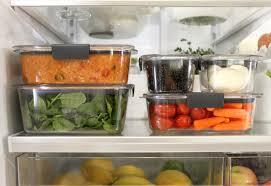 To prevent bacterial growth, it’s important to cool food rapidly so it reaches as fast as possible the safe refrigerator-storage temperature of 40° F or below. To do this, divide large amounts of food into shallow containers. A big pot of soup, for example, will take a long time to cool, inviting bacteria to multiply and increasing the danger of foodborne illness. Instead, divide the pot of soup into smaller containers so it will cool quickly. Sometimes there are leftover “leftovers.” It is safe to refreeze any food remaining after reheating previously frozen leftovers to the safe temperature of 165° F as measured with a food thermometer.